"True Grit" has been touted to be the film that will bring the American/Hollywood Western genre back from the grave. It has won and been nominated by numerous award-giving bodies. Ten of which are nominations at the upcoming Academy Awards including a nomination for Best Picture. It is also a remake of a classic 1969 film of the same name starring one of the best known American actors of all-time with John Wayne. 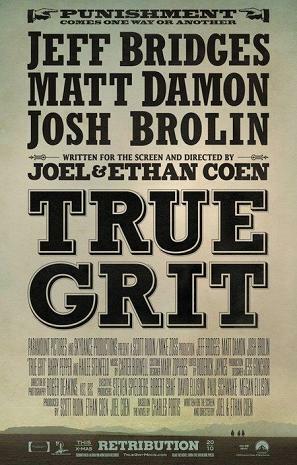 The Coen Brothers has set the bar high with "True Grit" and their track record shows they can deliver with films like "Fargo" and "The Big Lebowski" to name a few. What we can say is that "True Grit" is an extraordinary experience - a film that breaks the acceptable and dares to bring you back to a different era - and does it spectacularly. Mattie Ross (Hailee Steinfeld has just lost her father in the hands of Tom Chaney (Josh Brolin). Chaney shot and stole his father's horse and two California gold pieces. The 14 year old girl decides to hire a Deputy U.S. Marshall to track down and capture Chaney. She decides to get Rooster Cogburn (Jeff Bridges) as he is described to be the most merciless. Mattie also meets with Texas Ranger LaBeouf (Matt Damon) who is also out to get Chaney for killing a state senator. The three eventually team-up to bring tom Chaney to justice. The words "True Grit" mean unfaltering courage - the film of the same name is the epitome of that meaning. It showed unfaltering courage by being different from your conventional Hollywood film and the risk was worth the reward it reaps. The film "True Grit" gives off a nostalgic feel from movies of past. Not a bad idea as it felt like watching "Gone with the Wind" and god knows how good that film was. What makes "True Grit" a true classic though is the depth of its characters. From the brash, young and cocky Mattie Ross to the old drunken Rooster, each character has their own stories and secrets to reveal. Mind you though that these are revealed in a slow, steady manner through small talks and conversation along the film. Was "True Grit" dragging due to this? Not at all especially with the actors giving it their best. We liked Jeff Bridges and Matt Damon but the 14-year old Hailee Steinfeld stole the show. "True Grit" is a must-see not because of guns-a-blazing action that we are usually seeing nowadays - the believable characters and their charisma steered the film to greatness. - the character depth is the best part of "True Grit"